Have you ever wondered what kind of homes people on the other side of the world are living in? I have. A person’s home can tell a lot about their life and culture, both of which are interesting topics for me. Today, I’d like to share with you a special app called Homes. 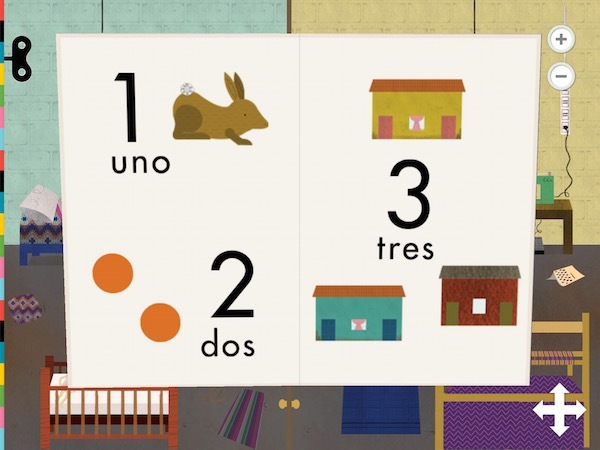 Developed by Tinybop, it’s an open-ended interactive playscape in which kids explore four unique homes from around the world: the Guatemalan adobe, the Brooklyn brownstone, the Yemeni tower house, and the Mongolian ger (yurt). Located in different environments, each house has a story to tell. You can discover these stories by looking at the surrounding area, as well as the rooms inside each house. There are more than 20 spaces to explore, each packed with items that provide hints to what life is like in that household. Many items are interactive; you can drag logs to the stove and build a fire in the yurt, for example. Other things to do include washing dishes in a pila (a multipurpose sink) in Guatemala, drawing all over the sidewalk with a chalk in Brooklyn, and feeding the goat in Yemen. You can tap on the plus button on the top right to take a closer look at a scene, and quickly find interactive items. You can also move the sliders to see how electricity and water travel around the building. To switch between night and day, tap on the sun/moon. The app includes a label feature, which can be turned on to show the name of each individual object. The labels are available in more than 50 languages, although only 5 are shown by default. You can specify which languages should appear from the parental dashboard. To support your child’s experience, you can download the companion Homes Handbook from the developer’s website. It contains interaction hints, facts about each home, and questions to discuss with your kids. How is my home similar to and different from these homes? How might weather, climate, and culture influence architectural styles? How does every home light up? The Handbook is available for free in 12 languages, including English, Spanish, Russian, Japanese, Chinese, and French. Homes does not contain ads and in-app purchases. Homes is a great tool for kids to explore cultures around the world. As they explore the nooks and crannies of each home, they can gain insight into how other people might live. Hopefully, it will make them appreciate their own home. Beautifully illustrated and full of details, there are many neat things you can discover in each home. If you rummage through the books, for example, you can learn the names of various local food. You’ll also find book copies of Tinybop’s previous works, The Human Body and Plants. A clever trick is found in the Mongolian yurt, where the mirror will reflect whatever your device’s camera is capturing. The latest update also lets you decorate the row-houses in New York with Christmas decorations. While the homes are full of items, you won’t find actual people living there. I think it’s a great design decision, as it leaves kids free to imagine what life is like in each home based on their exploration. Homes by Tinybop lets you take a peek inside four different homes from around the world. You can explore the nooks and crannies of each beautifully illustrated home and discover what makes it unique. A customizable label feature names all objects in more than 50 languages. It’s a neat exploration game for kids as well as adults who enjoy learning about world cultures.